I made purchase of Godless Wolf Shards from Group Buy and bought 200 shards with 2900 diamonds and 1300 Group Tickets when the discount was 30% and the price of 200 shards was 4200 diamonds. After the end of Group Buy, the discount was 50% meaning the price was 3000 diamonds now. 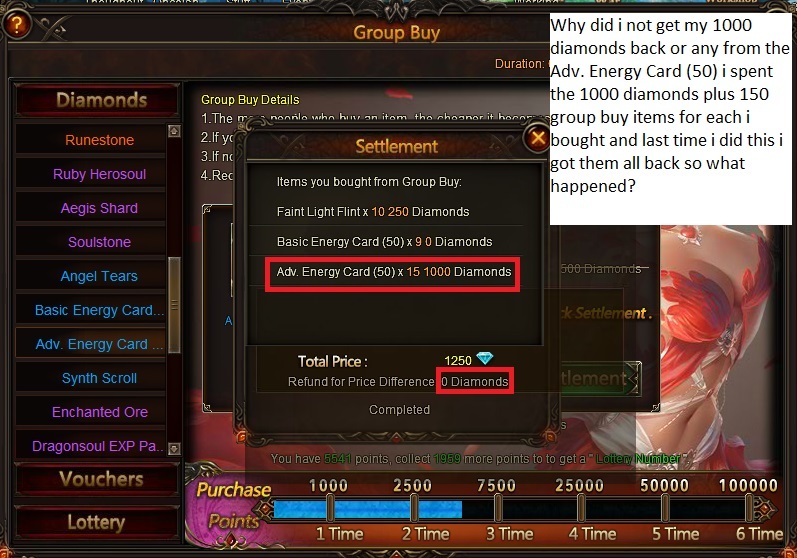 So I wanted to ask that am I supposed to receive some diamonds as refund after settlement? As you can see, I bought the shards but wasn\'t refunded with any diamonds. I\'d just like to know whether I\'m supposed to receive diamonds or not. And if I\'m supposed to then I\'d like them asap. 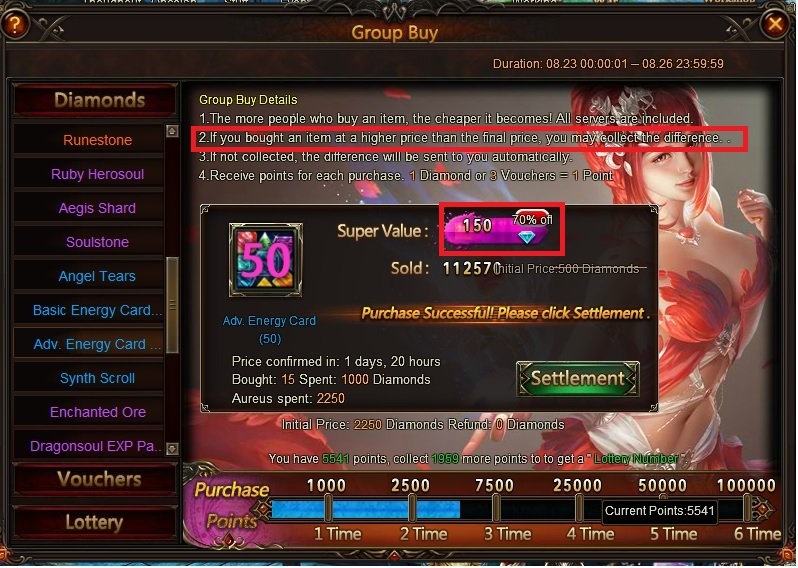 Dear player, that is how the group buy settlement works. But let me explain further. Total Price(at time of purchase) - Total Price(highest discount) - Group Ticket Used = Refunded dias. Hope my explanation meet your satisfaction. Have a good day. Okay thanks. If I\'d have known it I\'d have bought shards after 50% discount but everyone learns from mistakes I guess. i don\'t get it the last time i bought the Adv. Energy Card (50) i got all my diamonds back even with the 150 Group buy item used for each. Or was that only for the other event with the other items? ;cause the first picture i have highlighted the very part that i bought them for cause they did give them back for my last one i bought some in. I think the FM stated why diamonds won\'t be refunded. If not clear, wait for FM\'s proper reply then. 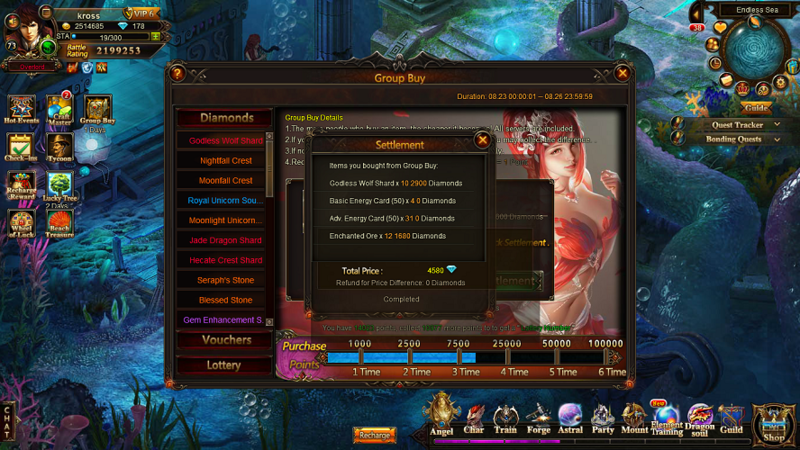 Dear player, as my explanation in #1 and as kross said, that\'s how the group buy settlement works. At least you had a chance to do settlement. ;Still 8/27 ALL DAY LONG today and there is no Group Buy on either of my servers. I don\'t know but I\'m still a little confused. Why is the refund option available if one won\'t get refund even after discount went from 30% to 50%? And why would someone want to buy an item at 30% discount like that? Bcoz clearly 50% discount is alot better than 30% in every case. It should be clearly stated that group buy tickets would not be counted during refunding procedure. so you can use all dias and hope the % goes up and you get the refund, or save dias off the bat by using tickets, it can be good or bad depending on how many buy. some times its a wash. alot of players just wait until it hits 70% then use max tickets. but someone still has to buy the first X # of item to get it there. 2019-4-21 11:12 GMT+8 , Processed in 0.098923 second(s), 52 queries .